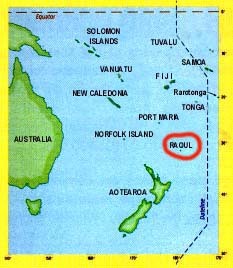 The Republic of Raoul is located in the South Pacific Ocean. Established in 1937 as a Kingdom ruled by a hereditary monarch, it became a republic in 1998, when the ruler, Queen Aveline, dissolved the monarchy and proclaimed Raoul to be a slave republic. Click here to read the President's proclamation. The island was settled in the 1930's by immigrants from Aotearoa, and has a tropical climate, giving excellent horticulture. Only Female persons can hold citizen status; all males are slaves or tourists. Today, the country is a member of the International Council of Independent States (ICIS), the "United Nations" of the Fifth World. The main town is Fleetwood. The island is volcanic, and has constant seismic activity. The currency is decimal: 100 cents (¢) = 1 dollar ($). The Raoul dollar is tied to the Australian. Click here to convert your currency into Australian. Raoul's economy is heavily dependent on sales of postage stamps and export of citrus fruit and nuts. To see photos of the country, click here. Mistress Aveline approves the opening of a free Classified Advert section on the Raoul Government official website. This is mainly to benefit local philatelists keen to buy and sell stamps and envelopes, but other folk from round the globe are also welcome to use the service. Go to the Classified Adverts.